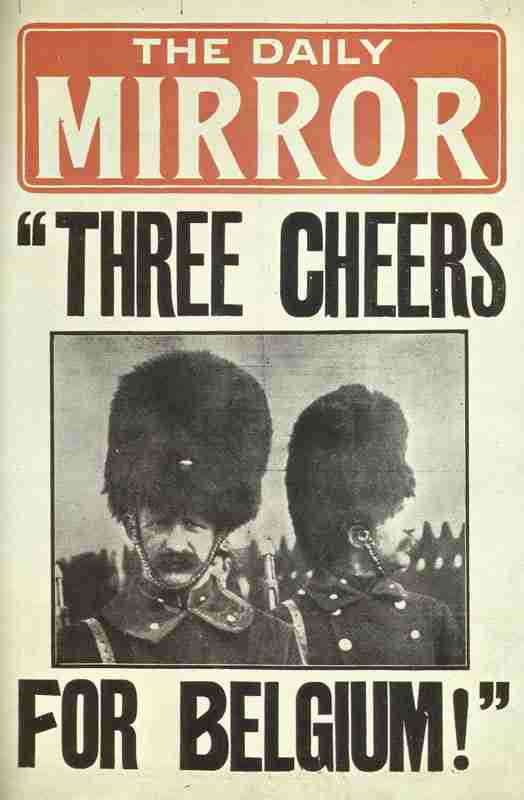 Three Cheers For Belgium: Britain’s ‘Daily Mirror’ echoes the nation’s commitment. Belgium: King Albert orders the Belgian Army, some 75,000 men, to retreat to the port of Antwerp, which has a garrison of 60,000 men. The move is completed by August 20 and the Germans deploy some 60,000 men to keep Leopold bottled up in the fortified city as the bulk of their forces push toward the Franco-Belgian border. Battle of Gettes (until August 19): actions of Grimde and Hautem St Marquerite. Germans capture Tirlemont as Belgian Army retreats (1,630 casualties) to Antwerp. Lorraine: French II Cavalry Corps enters Saarbourg after skirmish, VIII Corps follows pushing to north and east of town but attacks blocked (on August 19 and 20), suffers more than 50% casualties by evening August 23. French XV Corps occupies Dieuze. 63 Russian infantry divisions now operational, of these 35 against the Austrians. Galicia: Brusilov’s Eighth Army invades against token resistance. Serbia: Austrian IV Corps fails to break out of Sabac bridgehead and being massacred at river Dobrava. Serb Second Army attacks all day taking three positions of Austrian 9th Division and repelling counter-attacks. Night attack eventually gains Kosanin Grad (0500 hour on August 19). Austrian XIII Corps attacks against Serb Third Army gain little progress. Japan: Prime Minister Count Okuma says ‘Japan’s object is to eliminate from continental China the root of German influence’. Canada: Parliament in special war session until August 22. Votes for $50 millions War Measures Act and Canadian Patriotic Fund.